Selection of Polish underground publications. Polish underground press devoted to prohibited materials (sl. Polish: bibuła, lit. semitransparent blotting paper or, alternatively, Polish: drugi obieg, lit. second circulation) has a long history of combatting censorship of oppressive regimes in Poland. It existed throughout the 19th and 20th centuries, including: under foreign occupation of the country, as well as, during the totalitarian rule of the pro-Soviet government. Throughout the Eastern Bloc, bibuła published until the collapse of communism was known also as samizdat (see below). In the 19th century in partitioned Poland, many underground newspapers in the Polish language appeared; among the most prominent was the Robotnik, published in over 1,000 copies from 1894. 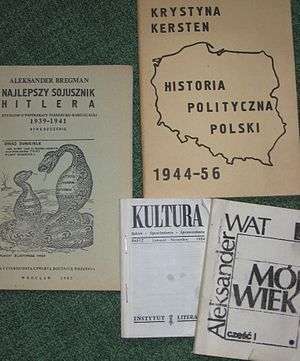 In the Second World War, in occupied Poland there were thousands of underground publications by the Polish Secret State and the Polish resistance. The Tajne Wojskowe Zakłady Wydawnicze (Secret Military Printing Works) was probably the largest underground publisher in the world. In the Polish People's Republic during the 1970s and 1980s, several books (sometimes as long as 500 pages) were printed in quantities often exceeding 5,000 copies. Actual newspapers were also published. For example, in 1980, a news-sheet, Solidarność, reached a print run of 30,000 copies daily, and some of the largest runs reached over 100,000 copies. Most of the Polish underground press was organized in the 1970s by the Movement for Defense of Human and Civic Rights (ROPCiO) and Workers' Defence Committee (KOR). Over several years, alongside hundreds of small individual publishers, several large underground publishing houses were created, fueled by supplies smuggled from abroad or stolen from the backrooms of official publishing houses. The Polish underground press drew on experiences of Second World War veterans of Armia Krajowa and much attention was paid to conspiracy; however, after martial law in Poland and the government crackdown on Solidarity, the activities of underground publishing were significantly curtailed for several years. Nevertheless, with the communist government losing power in the second half of the 1980s, production of Polish underground printing (bibuła) dramatically increased, and many publications were distributed throughout the entire country. After the Revolutions of 1989 some of the underground publishers in Poland transformed into regular and legal publishing houses. There were important differences of scale between Polish underground publishing and the samizdats of the Soviet Union, Hungary, Czechoslovakia, and other countries in the Soviet Bloc. In the 1980s, at any given time there were around one hundred independent publishers in Poland who formed an exceptionally vibrant segment of the black market. Books were sold through underground distribution channels to paying customers, including subscribers. Among the few hundred regional periodicals, the "Tygodnik Mazowsze" weekly reached an average circulation of 60,000 - 80,000 copies, while some issues topped 100,000. The estimated production of books and thick journals can be put close to one thousand per year and more than one million copies. Other products on this market included audio cassettes, videocassettes, posters, postcards, calendars, stamps and buttons. ↑ Colin Barker, The rise of Solidarnosc. International Socialism Quarterly, 17 October 2005. ↑ Archiwum Opozycji. Materiały dotyczące oporu wobec władzy komunistycznej (Collected materials of the anti-communist opposition in Poland). Ośrodek KARTA Center. Retrieved October 15, 2011.